Looking for beautiful jewellery made traditionally in the UK? Want to treat someone special but worried about the cost of true quality? With a Lets Buy Gold voucher you can enjoy fantastic savings on stunning necklaces, earrings, bracelets and more – all made in and around London's famous Jewellery Quarter. So whether you want to give a memorable gift or just treat yourself, Lets Buy Gold voucher codes will save you money while you shop. Lets Buy Gold is the online trading arm of Apollo Kutock Ltd. - an authentic family-run jewellery business that has over 58 years' experience in the industry. Designing and manufacturing jewellery in and around Hatton Garden – London's famous Jewellery Quarter – Lets Buy Gold has its roots deep within the history of the city's artisan craftsmen, and prides itself on its reputation for quality and fine workmanship. Today, Lets Buy Gold lets customers from all around the world sample some of the finest traditionally made jewellery in London. By combining the work of talented local jewellery makers with raw materials obtained from the most reliable overseas stone merchants and cutters, Lets Buy Gold is able to offer a wide array of pieces, including striking gem stone combinations rarely seen elsewhere. And by buying from their suppliers in bulk they are able to negotiate excellent discounts – savings that are then passed on down to the customer. This means that Lets Buy Gold can offer genuine quality jewellery set with real gemstones at everyday affordable prices – so there's no excuse not to treat yourself or that special someone in your life. Whether you're looking for 14 carat gold rings set with diamonds and other precious gemstones or some more understated silver jewellery, Lets Buy Gold is sure to have the perfect piece for you. They also stock a wide range of wedding rings, engagement rings and jewellery cleaning products – so there really is something for everyone. An established online business, Lets Buy Gold has been successfully using their website to supply an international customer base since 2000. They offer a secure payment system and a fast, efficient delivery service that ships your goods in record time. They can even arrange express delivery to an address of your choice – perfect if you've left present buying until the last minute! Want to get shopping with Lets Buy Gold? With a Lets Buy Gold voucher you can enjoy fantastic savings on a wide range of quality jewellery. So whether you need the perfect finishing touch for an outfit or a present that's sure to win brownie points, Lets Buy Gold vouchers will help you buy the best for less. All jewellery made and manufactured in London's Jewellery Quarter. Browse our website until you find a Lets Buy Gold voucher that suits you, then navigate to their website to begin shopping. Click on a product for more information and click 'Add to cart' to buy. When you're finished shopping click 'Checkout'. Enter your Lets Buy Gold discount code where applicable. If you've enjoyed shopping for quality jewellery with Lets Buy Gold, you might like to check out our great deals on designer clothing from Debenhams or beautiful lingerie from Anne Summers. Or, if those aren't right for you, you'll find plenty more stores to browse in our Fashion, Accessories and Jewellery section. Enter your Lets Buy Gold discount codes where applicable. Enter your address and payment details to complete your order. Free standard insured shipping to the UK is available on all orders. Special and international deliveries are available for a small fee. If you need to return a product for any reason to Lets Buy Gold, you can do so by simply returning your item in its original packaging within 30 days of receipt. Need to contact the team at Lets Go Gold? Whether you have a question about your order, want to know more about choosing the right jewellery size or simply want to know how you could save money with Lets Buy Gold voucher codes, you can contact the Customer Services department by telephoning 0800 634 8570. 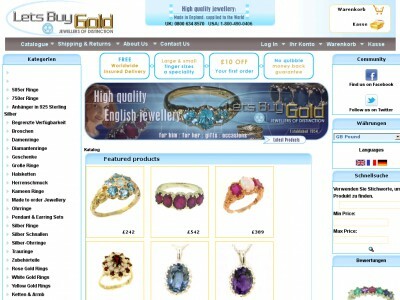 Want to find out more about the beautiful products on offer at Lets Buy Gold? Why not follow the company across your favourite social media channels? You'll find lots of exclusive content including new collection previews, styling tips and guides, competitions, special offers and more. You can also use these pages to find out more about saving money with Lets Buy Gold vouchers. Don’t forget to check them regularly, as you can never be sure when a free Lets Buy Gold voucher might be waiting for you! Buy now online at www.letsbuygold.com. I wanted some gold jewellery for my birthday, but didn't want my husband to spend a fortune – so I left a Lets Buy Gold voucher lying around. With Lets Buy Gold vouchers, you can get great discounts on beautiful gold jewellery hand made in the UK at letsbuygold.com. He took the hint, and used the Lets Buy Gold vouchers to buy a gorgeous gold chain and pendant – I was so happy with my gift! So why not treat the special someone in your life with a Lets Buy Gold discount code?